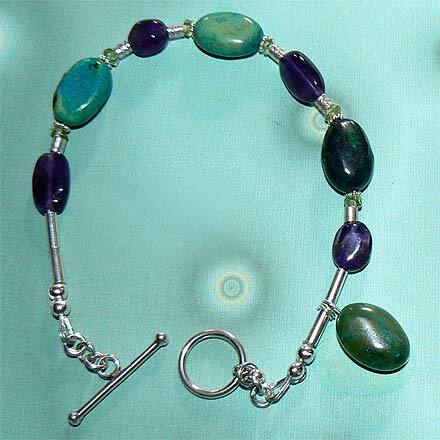 Sterling Silver Chrysocolla, Amethyst and Peridot Bracelet. 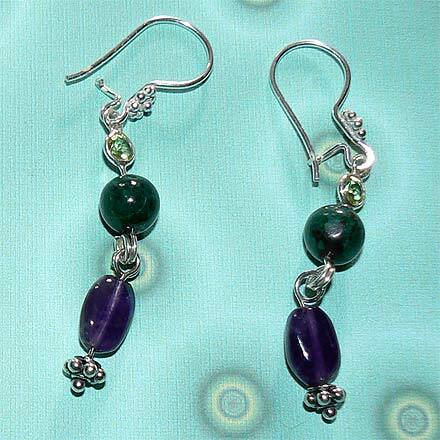 Sterling Silver Chrysocolla, Amethyst and Peridot Earrings. Necklace has a unique asymmetrical pendant with a floral fleurish on the right side. Clasp is from Thailand and features a Waterlily design. All items feature lovely blue-green Chrysocolla beads highlighted with Amethyst and Peridot. For those who are interested in Astrological significances of stones, Chrysocolla corresponds with Gemini, Virgo and Taurus; Amethyst corresponds with Pisces and the month of February, and Peridot corresponds with Libra and with the month of August.